I first made this salad with potatoes that had literally been pulled from the ground (at Morning Glory Farm on Martha’s Vineyard) that morning. I also had some fresh peas, and the two seemed made for each other. 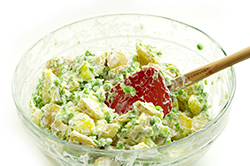 I made a dressing that’s a riff on one my friend and potato guru Molly Stevens makes for a lemony potato salad. 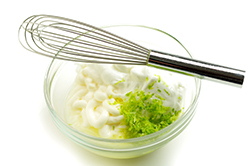 She lightens her mayonnaise with lightly whipped cream; mine has Greek yogurt (and lime zest) instead. I loved this salad the first time I made it, and I still do. 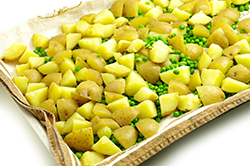 To save time, you can quick-chill the potatoes in the fridge for 20 minutes before you mix them with the dressing. 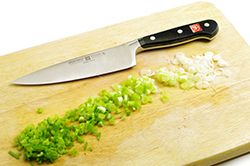 If you’re not in a rush, you can let them cool gradually at room temperature. Either way, if you get the potatoes going first, you can easily make the dressing in the time it takes for the potatoes to cook and cool. This salad has a really lively flavor (thanks to lots of lime) that would pair well with a grilled, butterflied leg of lamb with a spice rub on it. But it’s a perfect potluck dish! One note: I have found that when doubling the recipe, I need slightly more dressing than a double amount, so add an extra tablespoon each of mayo and yogurt. 1. 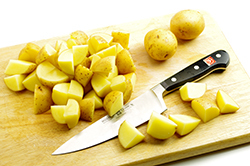 Put the potatoes and 2 tsp of the salt in a large saucepan and cover with plenty of water. Bring to a boil, reduce the heat to a simmer, and cook until almost tender, about 10 minutes. Add the peas and cook for 2 to 3 minutes more. Drain the potatoes and peas carefully in a colander and rinse them gently with cool water for a few minutes. 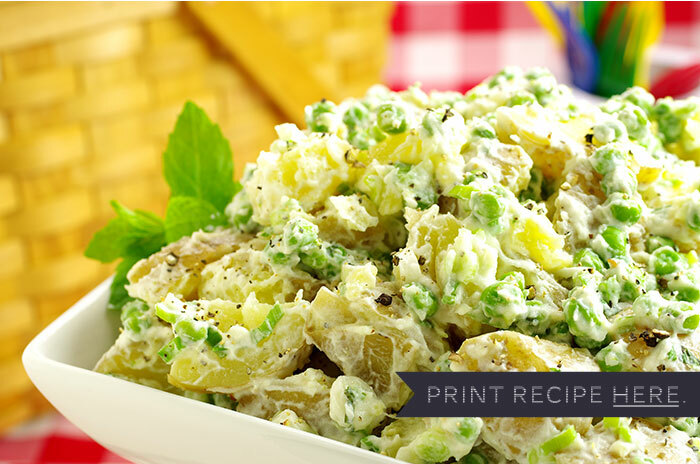 Spread the potatoes and peas out on a small rimmed sheet pan and refrigerate for 20 minutes to cool. 2. 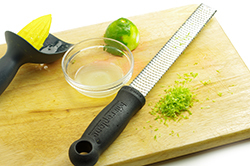 Meanwhile, whisk the mayonnaise, yogurt, lime zest, and lime juice in a medium mixing bowl. 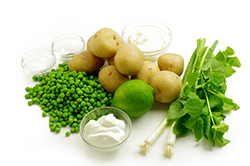 Add the cooled potatoes and peas, the scallions, 2 Tbsp of the mint, the remaining 1/2 tsp. salt, and several grinds of fresh pepper. Mix gently but thoroughly with a silicone spatula. Taste and add a little more salt. If desired. Garnish with the remaining 1 Tbsp of mint.